STRIPER SOUP :: View topic - Happy Birthday Ezell!! Posted: Tue Nov 02, 2010 5:46 pm Post subject: Happy Birthday Ezell!! Not sure if it's actually your birthday or not, but you posted somewhere that winning the mayor's race today would be a great birthday present. So I am wishing you well for both your birthday and your race to get re-elected as mayor! GO EZELL!!! 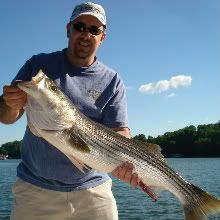 One of, if not the best striperfishing friends there is!! P.S. I'm stilling waiting to see that 45+ on the 12lb line! Well I had a great birthday present Nov 2nd. I don't have to be mayor any more. Maybe the incumbents in D.C. will get put out also. I am ok with that so watch out striper I could not post the 45.7 pounders picture from the past week so I sent it to friends by e-mail and maybe they will help. I think I need some new fishing equipment like computer and camera. HAPPY BIRTHDAY Ezell and WATCH OUT striped targets!!! Hate you didn't win re-election, however it sounds like you are pleased with being able to get back to the fishing. Right on brotha!!! Happy B-day big E. Go get them stripes. Happy birthday Ezell!! Our fishing friend. Sorry about the election, but being boss isn't all it's cracked up to be. Thanks fellow soupers. I enjoyed the experience of being mayor but I think it is the best thing that could have happened. Get back to fishing more. The fish is a 45.7 pounder caught in Norris in water less than 4 feet deep. The first strike was a miss but impressive and then when hooked up on the next strike, WOW. Mike Daughtery from northern Ohio caught it on Oct. 18 on 12 pound test line. He was recovering from shoulder surgery so had difficulty holding the fish. He said, "I know you said we can't keep any fish but would you consider it. I am a taxidermist and will also save the meat." I agreed for him to keep it. We also caught a good number of fish over 10 to near 30 pounds all in skinny water. Thanks for helping Shawn because we needed some fishing excitement to SHOW and tell. Posted: Wed Nov 03, 2010 6:54 am Post subject: Technical pic loading info..
Ezell, I think you were having trouble trying to upload the pic because you had spaces in the name, as well as an apostrophe. Computers get a hickup (or hiccough if you prefer, I like to spell phoenetically [I mean funedickly]) when you use certain characters, including space, in the file name. Dashes are ok, but not quotes, brackets, or spaces. I changed the name and everything worked out fine. It's great to see a quality fish out of Norris! You da man Ezell! When you gonna put me on one of those?!! Happy Birthday Ezell Very nice fish. The Stripes better watch out for you now!! Ezell if that's YOU you're getting not only BETTER, but YOUNGER! Happy Birthday and what a timeless present: TIME TO FISH! LOL! It is a good fish and the heaviest I know of since the kill in the summer of 2003. The same year Smith Mountain had one. S.M. striper fishery is very much like Norris in many ways. I believe your fish have got a good recovery started also. I think you have more numbers than Norris and that normally means some size loss. I will try again to post some more of my latest pictures next week Shawn. Thanks again. LMJ that would be Mike Daughtery that caught the fish from my boat. I know I am better looking than him Thanks again soupers for the Happy Birthday wishes. I am glad to be out of office, along with all the others that got voted out. NOW if we can get that other azz off the top out of office next election. Posted: Thu Nov 04, 2010 9:43 am Post subject: Happy Birthday Ezell! Thats a beautiful fish you found... You're swapping the title of Mayor for "General" .... General Consultant..... Enjoy while you're still young! Congrats for putting that gentleman on that fish too! Seems you are OK with being out of the mayoring business, I bet the local striped bass population wishes you still had work to do at town hall. All kidding aside, it takes a special type of person to go into public service, my hat is off to you for making such a commitment of time and energy.